In the congested urban areas, tunnelling close to existing structures often occurs due to the lack of space. Consequently, tunnelling-induced ground movements may cause serious damage to the adjacent structures. Ground surface settlement caused by tunnel excavation varies in magnitude and trend depending on several factors such as tunnel geometry, ground conditions, etc. There are several empirical, semi-empirical equations and numerical methods available to estimate ground surface settlement associated with excavation activities, however among these methods most of empirical and semi-empirical based methods do not simultaneously take all the relevant factors in the complex condition into account. In complex conditions, numerical methods can be used for resulting accurate predictions. 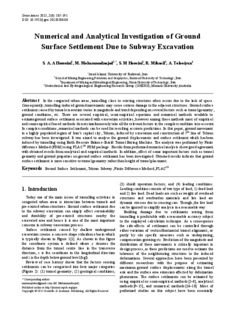 In this paper, ground movement in a highly populated region of Iran’s capital city, Tehran, induced by excavation and construction of 7th line of Tehran subway has been investigated. It was aimed to analyse the ground displacements and surface settlement which has been induced by tunnelling using Earth Pressure Balance-Shield Tunnel Boring Machine. The analysis was performed by Finite difference Method (FDM) using FLAC3D FDM package. Results from performed numerical analysis show good agreement with obtained results from analytical and empirical methods. In addition, effect of some important factors such as tunnel geometry and ground properties on ground surface settlement has been investigated. Obtained results indicate that ground surface settlement is more sensitive to tunnel geometry rather than height of tunnel placement.